We’d love your help. Let us know what’s wrong with this preview of Love Big, Be Well by Winn Collier. When Granby's pastoral search committee and Jonas connect through handwritten letters passed back and forth, so Jonas McAnn is a weary pastor without a congregation, trapped in a dead-end insurance job. Granby Presbyterian is a weary congregation without a pastor, overwhelmed by the prospect of finding someone who actually wants to be a pastor—not a manager, coach, or CEO. When Granby's pastoral search committee and Jonas connect through handwritten letters passed back and forth, something sparks between them—something so real and refreshing that even after Jonas and his family move to Granby, he continues the regular practice of writing letters to his congregation. Spanning seven years of his ministry at Granby Presbyterian, Jonas's letters ruminate on everything from fly-fishing to the Nicene Creed. They reveal the earthy spirituality woven into the joys and sorrows of the people of Granby, the community of the church, and Jonas's own unfolding story. To ask other readers questions about Love Big, Be Well, please sign up. Winn was our pastor back in our college days and this book made me miss him and that little church all over again. Lately, my struggles with faith and church leave me feeling lonely, but Winn’s words helped me feel less so. This collection of fictional letters from a pastor to his fictional small-town congregation is a lovely read, full of reminders of what real community looks like on the ground. It reminded me strikingly of Jan Karon's series of novels set in small-town Mitford, with the wisdom and love of real people in a real place and the love of a pastor for his flock. This celebration of ordinary life lived in community--in both Karon's Mitford and Collier's Granby--is wholly attractive. So why only 3 stars? This collection of fictional letters from a pastor to his fictional small-town congregation is a lovely read, full of reminders of what real community looks like on the ground. It reminded me strikingly of Jan Karon's series of novels set in small-town Mitford, with the wisdom and love of real people in a real place and the love of a pastor for his flock. This celebration of ordinary life lived in community--in both Karon's Mitford and Collier's Granby--is wholly attractive. So why only 3 stars? In the end, I felt that Pastor Jonas held out a too-small view of God and the church, perhaps thanks to a too-small idea of God and the church he is building. Are we so immured in our doubt and weakness that we cannot aspire to more than slogging along together in kindness? Where is the fuel for a big love and a well-lived life, if not in the great promises of Scripture, which offer us a bold and audacious life that spills beyond us and inspires us to great prayers, the kind of prayers the Apostle Paul prayed for the churches he wrote to? Required reading for anyone who's ever been on a vestry, a parish council, or a pastoral search committee! Funny and moving. I wasn't at all hesitant about this book because I love Collier's wisdom and words. . . and I'm a small-town church-goer myself. But when I saw it was letters, I did pause . . . so glad that didn't stop me. The book is honest and real because it's about a pastor and the people in his church . . . and the hard, beautiful parts of their lives together. In every way, this book was a balm, a respite, a hand to help me up. I cannot recommend it enough. If it weren't for the high praise offered by John Blase, author of The Jubilee, one of my favorite collections of poetry, I am not sure I would have happened upon this remarkable book. Love Big Be Well (2017) by Winn Collier is such a warm and welcome gift. About two-thirds of the way through it, I wrote inside the front cover, "this whole book is a benediction." Love Big Be Well offers a unique premise. A disenchanted man, Jonas McAnn, responds to a handwritten letter from a pastoral search com If it weren't for the high praise offered by John Blase, author of The Jubilee, one of my favorite collections of poetry, I am not sure I would have happened upon this remarkable book. Love Big Be Well (2017) by Winn Collier is such a warm and welcome gift. About two-thirds of the way through it, I wrote inside the front cover, "this whole book is a benediction." Love Big Be Well offers a unique premise. A disenchanted man, Jonas McAnn, responds to a handwritten letter from a pastoral search committee from Granby Presbyterian Church, ultimately becoming this small town church's pastor. The book is a collection of pastoral letters, which routinely conclude with "Love Big. Be Well. Jonas." In these letters, Jonas addresses several aspects of the Christian life, identifying what he sees as marks of true faith and those that seem to be counterfeits of what Jesus actually said with a raw honesty. One of the advantages of using a fictional story like this is the ability to describe one's convictions without seeming self-important. Collier also accomplished what I think was an impressive rhetorical feat: I came to care deeply about the members of the church, and especially Don, through the pastor's descriptions in his letters. Fictional letters about fictional characters, and yet I was moved. Several times, I found myself longing to read more about Port William, Kentucky, Wendell Berry's fictional small town because in many ways, Collier's book was reminiscent of Berry. I hope that Winn Collier will bring us back to this church, by writing us a novel set right here, with the people who received these letters. The letters hold big and important ideas - but I'd love to see the stories all fleshed out. I want to know more about this "small town church." 😊 Collier has the skill to do it! Summary: Letters written through the seasons of the church year by Jonas McAnn to the people of Granby Presbyterian Church on the varying facets of believing and living as a church, the warmth of friendship and the dark nights of doubt, each ending with the words "love big, be well." It is still early in the year, but I think this book is going to end up on my "best of 2018" list. Perhaps it is because I resonate with so much here, and because it is written so well. A disillusioned pastor making Summary: Letters written through the seasons of the church year by Jonas McAnn to the people of Granby Presbyterian Church on the varying facets of believing and living as a church, the warmth of friendship and the dark nights of doubt, each ending with the words "love big, be well." "Here are our questions. We'd like to know if you are going to use us. Will our church be your opportunity to right all the Church's wrongs, the ones you've been jotting down over your vast ten years of experience?...Is our church going to be your opportunity to finally enact that one flaming vision you've had in your crosshairs ever since seminary, that one strategic model that will finally get this Church-thing straight? Or might we hope that our church could be a place where you'd settle in with us and love along-side us, cry with us and curse the darkness with us, and remind us how much God's crazy about us? In other words, the question we want answered is very simple. Do you actually want to be our pastor?" "This letter is too long, just like my sermons. I'm working on it. But all this is to say that if our conversation leads anywhere and I were to join your motley band, being your pastor is the only thing I'd know how to do. I'm at an utter loss on anything else." " If I were your pastor, I'd want to continue this letter-writing thing. We're on to something. The church agrees and this is the first of many letters from 2008 to 2014, when he takes a sabbatical. The letters sparkle with the warmth of his growing friendships with the people of this church, notably big Don Brady, a hulk of a man who came to faith later in life, and who later experiences a recurrence of a cancer that had been in remission. He reflects on the nature of this thing they call church and the high-blown language and cant that obscures the reality of friends on a journey together in a place. He honestly confesses to the mystery in much of which he preaches, and his own struggles to believe the things he proclaims from the scriptures--how often he preaches, prays, and lives into things when the feeling of confidence is absent. The letters continue when the honeymoon is over and they wrestle with the hard realities of this relationship between church and pastor. Toward the end, he includes a letter from Luther, chair of their elder board, the lone black, and what it is like to "represent" his people when he is just Luther, and yet how he does in feeling the pain and the disjuncts of racial history, even in their own congregation. "As the church, we're the people (whenever we live true to ourselves) who will welcome you into this world, who will join you in marriage and in friendship, who will bless your coming and your going. We will pray for you to prosper and know love's depths even if you think our prayers are foolish or offered in vain, and we will mourn you when you leave us. We will bless the land and the nations we share, and we will grieve together through tragedy and heartache. We will celebrate, with you, everything beautiful and good, everything that comes from the hand of mercy. And then, when your days conclude, we will bury you. We will return you to the earth and pray God's kindness over you. This is who we are. This is who I hope we will continue to be." This was one of a number of passages that caught my breath with the beauty, or the blunt acknowledgement of things for which I did not have nearly the words. I've been in a church for twenty-eight years that has been doing all these things, groping, imperfectly to be sure, to live out the realities of what it means to live in Christ both through the seasons of the church year, and all the seasons of life. We've been through vision and church growth processes, the products of which mostly reside in a file drawer somewhere. We're not a large bunch but we are blessed with a pastor who reminds me of Jonas McAnn. We celebrate births, seek to teach our children well, revel in marriages and housewarmings and summer barbecues. We've marveled as we've walked alongside saints like Betty, whose life seemed to burn brighter and brighter as cancer consumed her body. And we've sat with families in times of loss. Winn Collier describes a reality both of pastoral ministry and church life that seems from another time, what with all our language of "missional communities," all our strategies, and what not. In a society of virtual relationships, of celebrity pastors, and transience, I wonder how many find places like Granby Presbyterian? And I wonder how many simply want to be pastors of such places? When a pastoral search goes well, everyone wins. Last year when a soft-spoken lobsterman rose to his feet and challenged us at Spruce Head Community to seek a shepherd who would lead us and love us, we began praying and seeking to that end. The seeking and the finding has united us, and we are blessed to have welcomed a godly man and woman who are living small-town life alongside us, all the while holding forth the Word of Truth. Winn Collier is also a small-town pastor, but with Love Big, Be Well: Letters to a Small-Town Church, he’s wearing his fiction-writer’s hat. Nonetheless, his heart for ministry comes shining through along with a clear-eyed affection for Christ’s body, communicated through the character of Pastor Jonas McAnn. Formalized by four signatures, the letter went forth to all future candidates. In a half-hearted search of his own, Jonas McAnn saw in the letter a reason to reply with his own epistle, and finally, to leave behind his safe and predictable life in an insurance company cubicle, and to risk following his heart back into the trenches of pastoral ministry. What follows is a bundle of letters from Pastor Jonas to his flock, randomly spaced and warmly personal. They have landed on my doorstep as well with their revelation of one side of a “spacious” conversation between a man who knows he was not called into the pastorate to fix anything or anybody and a group of people who have committed themselves to contributing “disruptive input” to each other’s lives. With engaging characters and a page-turning narrative arc, Love Big, Be Well is a satisfying read for the story alone. Shades of John Ames of Gilead and Tim Kavanagh of Mitford made me hope for a sequel to follow Jonas’s return from sabbatical and future ministry at Granby Pres. However, at the risk of being banished to Wendell Berry’s desert island of exile for finding a subtext where none was intended, I will share that I came away with valuable insights — not in the form of a treatise on ministry, but rather more like thoughts overheard from a corner table at Stu’s Mud. When elderly Miss Nelson prayed over Don’s cancer treatment, she reminded me that even when we do not know the will of God on a matter, there’s nothing wrong with reminding Him of how much we love and need someone in our community. Jonas McAnn wrote letters to his congregation from a desire to pay attention and to help his people do likewise. He wanted to remind his readers that life together is good and it consists of shared stories — shared experiences that call us toward the Light. For anyone who is committed to this calling over the long haul, Love Big, Be Well is a benediction, a reminder that ministry is “shot through with blessing,” and a celebration of the dignity of the slow work of ministry in community. This is, hands down, my favorite book about church, people, love, living life well and true, community, belonging . . . you name it. I read a lot of non-fiction, good books, finely written books, some of them written by friends of mine. Not one of them comes as whisker close to truth as does this fictional compilation of letters. Maybe it’s because our church was going through its own search for a new pastor at the time I received this slender tome. Whatever the reason(s), this one struck a nerv This is, hands down, my favorite book about church, people, love, living life well and true, community, belonging . . . you name it. I read a lot of non-fiction, good books, finely written books, some of them written by friends of mine. Not one of them comes as whisker close to truth as does this fictional compilation of letters. Maybe it’s because our church was going through its own search for a new pastor at the time I received this slender tome. Whatever the reason(s), this one struck a nerve. Better, it struck THE nerve, that one that goes to the core of who we are and begins to resonate when we find true north. Built around the seasons of the church year, these 165 pages consist entirely of letters, most of them written by pastor-to-be, then new-pastor, then seasoned-pastor-approaching-his-first-sabbatical-leave Jonas McAnn. It is what is known in the trade as an epistolary novel and it is a hum-dinger. Herewith a sample — then get yourself to your favorite bookstore and order up a copy . . . or two or three. This would make a perfect gift for every single member of a search committee or a church leadership board. The book’s premise is that a pastor returns to the ministry after some time away working a secular job and accepts a position with a small town congregation, the fictional Granby Presbyterian Church. The book is a series of occasional letters from Pastor Jonas to his flock over the course of six years as he gets to Reading Love Big, Be Well by Winn Collier made my heart happy, and I highly recommend it to readers who are hungry for a break from big church clichés and over-promising certainties. The book’s premise is that a pastor returns to the ministry after some time away working a secular job and accepts a position with a small town congregation, the fictional Granby Presbyterian Church. The book is a series of occasional letters from Pastor Jonas to his flock over the course of six years as he gets to know them, grows to love them deeply, and walks through life with them. He shares his thoughts about God, his experiences with God, and how his beloved faith community can rest in God’s love. Never preachy, Collier gives Jonas a tender tone, portraying him as a humble, very human man of God who conveys wisdom and truth even while he confesses his own struggles, doubts, and failures. He never sets himself above his parishioners and is never paternalistic or patronizing. He is refreshingly honest while underplaying his own dogged faith and servant leadership example. I was captivated and found sentences and paragraphs in nearly every letter to highlight, notate, ponder, apply to myself, and remember. I was extra excited to read this book, because I recently moved to a small town myself. I have been struggling to adjust my perspective away from my university-town consumeristic “find a church that meets my needs” mentality. This book wasn’t really written to solve that problem for me, but it was well worth reading for so many other reasons. I think the people who might most benefit from reading it are weary pastors, from any size church. There is so much peace and rest offered within its pages. At numerous points throughout this book, I thought, “I would love to have a pastor like that.” There is a point at which Collier has Jonas say, “I write because I want to pay attention to the life happening around me.” This, and many other statements, convince me that this Jonas character is very much a manifestation of the author’s own thinking and personality. Actually, I did have a pastor like that before I moved away from Virginia. I was blessed to be a member of All Souls Charlottesville, where Collier shepherds his flock with the same tender wisdom. I miss him and that church terribly. There is so much more I could share, but I’ll leave the rest for readers to discover at their own pace when they are ready for it. That’s another practice I learned from this good author. “We may reject or neglect her, but the church stands witness to something larger than us, something tethered to our primitive memory, something that calls to us in times of distress, at the thresholds of life and death”. Normally, I start a review with a quote that has effected a response deep within me. However, within this small book, I’ve been so affected by, I’ve been compelled to find memes of quotes from the theologians that Collier sprinkles throughout this book, and have shared these gems “We may reject or neglect her, but the church stands witness to something larger than us, something tethered to our primitive memory, something that calls to us in times of distress, at the thresholds of life and death”. Normally, I start a review with a quote that has effected a response deep within me. However, within this small book, I’ve been so affected by, I’ve been compelled to find memes of quotes from the theologians that Collier sprinkles throughout this book, and have shared these gems before I quit for the night. This book has made me smile, and made me shed a tear or two. It has been an honor to be included in our church wide Lenten read even if I have trouble negotiating access to the building these days. This book is a series of letters started by a tired, burnt out Pastoral Search committee member who in response to the same old Profile, sat down and wrote a letter in longhand, talking to candidates as people, not pawns. It was enough to call a man who had left the ministry a number of years before. It was her outstretched hand he clasped and the church’s open heart that welcomed he and his family. Over letters stretched out 6 years, we see a church struggling to live and love in a society that may not choose to enter into faith, but accepting of how the institution is part of this particular community called to “Love Big [and] be Well”. I'm sure I enjoyed this book so much because I can insert myself right in with the mix of characters. Especially since our small town church in right in the middle of calling a pastor. When writing the initial letter the congregation asks "Or might we hope that our church could be a place where you'd settle in with us and love alongside us, cry with us and curse the darkness with us and remind us how much God's c I'm sure I enjoyed this book so much because I can insert myself right in with the mix of characters. Especially since our small town church in right in the middle of calling a pastor. When writing the initial letter the congregation asks "Or might we hope that our church could be a place where you'd settle in with us and love alongside us, cry with us and curse the darkness with us and remind us how much God's crazy about us?" I'm not a pastors wife, I would make a horrible pastors wife but I snorted out loud when I read the pastors description of his wife. I would love to be best friends with her. "I notice you didn't ask about my family. In a way, that's nice. A previous church thought my wife and I came as a package deal. They were in for a shocker. Alli doesn't play piano. Truthfully she'd need a bucket to carry a tune. She doesn't do children's ministry, either. And she's never been to a women's ministry craft night or a Christians women's conference. If your heart's broken or you need someone to drop an expletive and pray with you against the evil, Alli's your gal." This quote is on our chalkboard in the kitchen right now "While it's important to locate good coffee, it's essential to find good people whose love for their little nook of the world leaves you wanting to love your own little nook better." Winn Collier’s Love Big. Be Well. : Letters to a Small-Town Church is a gentle, human love story that begins with these two letters and continues with many more. It is a novel that has big things to say yet finds its transcendence by staying close to home. Granby Presbyterian is a church you want to join. Jonas is a pastor you didn’t know you longed for so hard until you read this book. Love Big Be Well is as easy to settle into as Jan Karon’s Mitford books and wise as Wendell Berry. Each chapter is a letter from Jonas to his church describing their lives together and offering gentle wisdom. This novel could be read by families who want a special reading for Advent or Lent and should be read by search committees, pastors and church members.
. . . if, that is, “the doctor” were diagnosing the state of the American Christian church experience. Only better. Better than a diagnosis. Better than a prescription. In Love Big, Be Well: Letters to a Small-town Church, Winn Collier draws us personally into the kind of church experience that perhaps few of us have known yet one for which most of us are longing. By the time I finished this book, my soul was so thoroughly overwhelmed by its beauty, its truth, it Just what the doctor ordered . . .
By the time I finished this book, my soul was so thoroughly overwhelmed by its beauty, its truth, its hope that I simply had to sit in silence to try to hold onto the blessing. Since other readers have already supplied thorough reviews of this book, I will join my own simple thoughts to theirs to provide additional notes in the paean of praise for Love Big, Be Well. This most recent gift from Collier’s pen is an epistolary novel. Using the vehicle of physical letters - not emails, not texts, not even Facebook messages but letters - written by Pastor Jonas McAnn to his new congregation at Granby Presbyterian Church, Collier gradually introduces us to various members of the church, their stories and struggles in the faith. - that friendship lies at the heart of church life! But, make no mistake; this is not a preachy novel listing dos and don’ts for church members. Quite the opposite. It is about entering deeply into love – as a receiver, as a giver. God’s love. Human love. And trusting that love to hold us and to hold us together. I appreciated this story of rootedness and friendship, of being committed to one place and people. If you were drawn to the vision of community in Wendell Berry and Marilynne Robinson, you will notice the same tone of unvarnished honesty and love in this story of cultivating a place of belonging. "But now you know that I'm a simple pastor. I don't carry much whiz-bang. I can write letters, though, and I'd like to offer these to you. Letters require time, a listening ea I appreciated this story of rootedness and friendship, of being committed to one place and people. "But now you know that I'm a simple pastor. I don't carry much whiz-bang. I can write letters, though, and I'd like to offer these to you. Letters require time, a listening ear, a curious heart. And I can offer those. [...] I write because I want to pay attention to the life happening around me, and I want to help you pay attention too. I write because I want to be the kind of person who would linger and write a letter, and because I suspect I have happened upon friends who instinctively know, perhaps better than I do, what I mean." "Can we settle down and be who we are, where we are? Can we take joy in the beauty already present in us and around us, right here, as things are?" "The deep places in our soul, the ambiguous terrain and those areas where we are experiencing seismic shifts, require space and quiet for us to honor what's happening in us and to us. We need time to consider what our questions uncover and what our experiences mean -- and what we are to do with all of this. [...] But maybe we can step back...and let our opinions take a backseat to our friendships." "The Psalmist tells us our days are numbered, and if that's the case, why waste a moment posturing?" Spoiler Alert: This collection of letters from an ordinary pastor in an ordinary small town Presbyterian church is a work of fiction. I didn’t get the memo and found myself a bit miffed to discover that the pastor and members of the congregation – whom I quite gotten to like over the course of the book – existed only in the Winn Collier’s imagination, however much they may have been abetted by the real people in Collier’s life. This is quite a spare book. The letters are occasional – 30 letters spread out over the course of 6 years. The topics seem randomly chosen, the way a good pastor would write letters on particular issues to a particular congregation – what churches should look for in a pastor, what pastors should look for in a church, how people join communities, how they live together, disagree, love one another, deal with one another and difficult circumstances and how to apologize when we blow it. Baptism shows up as do clergy conventions, reciting the Creeds, and hot topics (how to avoid). Collier writes a wonderful letter about blessing (giving and receiving and what it means for a pastor to bless a congregation). In another he muses about whether “being friends together” might not be a good way to think about what churches should strive for. One of the two letters in the book not written by the pastor comes from the Session President, the only black man in the congregation. I'll say no more than that this letter may be worth the price of the book. Highly recommended for young pastors serving ordinary congregations. Even more highly recommended for members of ordinary congregations. Your small group would find these letters short, thoughtful, wide-ranging and very easy to discuss. I paid $12.99 for an ebook of this book because it offered something that is rare, a book about ministry in a small church during ordinary life. It came with impressive endorsements and seemed to have good things to say. I understood from the beginning that this was not Christian fiction in the normal sense, playing out a story scene by scene. Instead it is fiction in the style of Screwtape Letters, with a fictional character talking about life from his point of view. Collier makes some good poi I paid $12.99 for an ebook of this book because it offered something that is rare, a book about ministry in a small church during ordinary life. It came with impressive endorsements and seemed to have good things to say. I understood from the beginning that this was not Christian fiction in the normal sense, playing out a story scene by scene. Instead it is fiction in the style of Screwtape Letters, with a fictional character talking about life from his point of view. Collier makes some good points using a compelling writing style. Mainly this book talks about the church as a place to belong, to like each other, bear with one another's foibles, and go through the contradictions of life together. He emphasizes the importance of being friends in ministry rather than showmanship from the pulpit. Love Big, Be Well is like an Impressionistic word-painting of life in a small town and the distinct role a church plays within that culture. Since I’m married to a small-town pastor, the idea of this book intrigued me. Winn Collier has a gentle prose style that teeters on the brink of poetry. He does a fantastic job capturing the ethos of ministry in a small-town church as only one can who has been there, done that, and he does it using a unique form of letter narrative. Through a progression of Love Big, Be Well is like an Impressionistic word-painting of life in a small town and the distinct role a church plays within that culture. Since I’m married to a small-town pastor, the idea of this book intrigued me. Winn Collier has a gentle prose style that teeters on the brink of poetry. He does a fantastic job capturing the ethos of ministry in a small-town church as only one can who has been there, done that, and he does it using a unique form of letter narrative. Fiction often bears truth. As I was reading this, I could think of several congregations that would write a letter similar to what Granby Presbyterian Church would write to pastoral candidates. They are a community of friends who want a pastor to help them grow in depth. In their rural area, growing in size probably isn't really going to happen. And, I know several pastors who would respond favorably to such a letter. They want to pastor a congregation, not be a CEO or advertising agent or whate Fiction often bears truth. As I was reading this, I could think of several congregations that would write a letter similar to what Granby Presbyterian Church would write to pastoral candidates. They are a community of friends who want a pastor to help them grow in depth. In their rural area, growing in size probably isn't really going to happen. And, I know several pastors who would respond favorably to such a letter. They want to pastor a congregation, not be a CEO or advertising agent or whatever the latest fad is. They just want to preach the gospel and be present with and walk alongside the people of God entrusted to him from cradle to grave. We learn about Pastor Jonas and the Granby church through a series of letters written by Pastor Jonas. We learn about issues in the community, Pastor Jonas' relationship with his denomination, the personalities that shine forth in the first five years of Pr. Jonas' pastorate. As a pastor, I read all sorts of books. Some are books of the trade - commentaries or leadership books that help me teach, preach, and serve my congregation well. Other books are sources of inspiration; I seek to be inspired by stories that challenge me and move my soul to action. And still other books are works that feed the spirit, strengthening me and encouraging me while engaging my mind and touch my heart. This last category is the type of book I most need, for it is the type of book that a As a pastor, I read all sorts of books. Some are books of the trade - commentaries or leadership books that help me teach, preach, and serve my congregation well. Other books are sources of inspiration; I seek to be inspired by stories that challenge me and move my soul to action. And still other books are works that feed the spirit, strengthening me and encouraging me while engaging my mind and touch my heart. This last category is the type of book I most need, for it is the type of book that adds color to my days and meaning to my life. 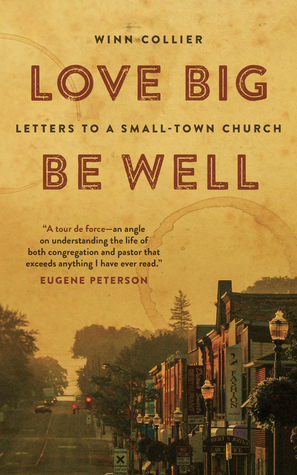 Love Big, Be Well: Letters to a Small-Town Church falls into this last, and most important, category for me. When I received the book, I set it aside for a moment of leisure; it struck me upon receipt as a fun read, enjoyable in the same way I have found other books like Phillip Gulley's Harmony series and Patrick Taylor's Irish Country Doctor series to be enjoyable - and it was. Yet as I turned the pages and immersed myself in the series of letters written by a pastor to his flock (in a context I recognized intimately, because of both geographic and cultural nearness), I found myself engaging the story on a deeper level. It was not just an entertaining story well-told. It was a vessel for ultimate considerations: life and death; friendship and social dislocation; community cohesiveness and external threats; God and humanity. I came to know and love the characters, in part because I saw myself and others I know and love in them. Their lives seemed real to me, because they reflect a life I know and can identify with. Winn Collier's newest book is a deceptive gem. It came wrapped in a slim paperback cover, suitable for throwing in a bookbag and reading in a hammock. I should know; that is what I did on a recent vacation. Yet as I turned the pages, I not only found myself enthralled as I would with any story well-told, but also thinking back on the words I had read long after the book was closed and set to the side. Who is this book for? Pastors and church members, yes - but also many more. Read this book if you wish to hear good news in an approachable format. Read this book if you want to meet folks you'll already recognize. Read this book if you have even just a few hours - because they will be hours well spent. Love big, Be Well is an ode to the beauty of "grit-and-grind" ministry and Christian fellowship in a small town church with big hearts and big pains. It is a hymn to those who have seen beyond the veil of pastoral ambition to the beauty of devoting their lives to serving and loving in one place for the long haul--particularly those parts of America often forgotten or overlooked. A testimony to the power of humility and vulnerability to unite a tired congregation in love and good works. Written as a series of letters from a pastor to his new congregation, it's hard to believe this is a work of fiction, as you'll find in it beautiful Christian truths, challenges, and encouragements worthy of the best Christian essayists and authors. Jonas McAnn is looking for a change for himself and his family. He has the heart and calling to pastor a church. There is a church congregation, Granby Presbyterian, who needs a pastor. A match of pastor and church is brought about through a series of letters between Jonas and the Granby Presbyterian Committee in charge of finding the right pastor for their people. After Pastor Jonas goes to Granby Presbyterian church to become pastor, he continues to write letters to this congregation, in addition to his pastoral duties. It is a journaling of emotion and sometimes very personal bonding to this congregation. As a former pastors wife, I could understand so much of the feelings and trust between Pastor Jonas and the people of the church. I loved reading this book of Letters! I had the unique opportunity to read an advance copy of this book, not because I have any qualifications for doing so but simply because I apparently won a lottery. What a blessing, what a privilege! This is about a fictional (maybe) pastor sending a series of very personal letters to a fictional (maybe) congregation. The letter format allows him to share with his flock with an honesty and openness that is probably not possible in a sermon. The letters contain some wonderful nuggets of wisdom tha I had the unique opportunity to read an advance copy of this book, not because I have any qualifications for doing so but simply because I apparently won a lottery. What a blessing, what a privilege! "Maybe we have too many words, or the wrong kind of words . . . Love's the main deal . . . I've found I just need to keep getting a bigger set of eyes . . . Go do joy . . . It's important to just show up . . . We do not need to live some other life in some other place. We simply need to be part of the common sound. Here . . . True patience means learning how to be *with* our life, to be present and curious and perhaps, above all, tenaciously hopeful . . . Our life is not ours to hold together." This is a newly released book, not all that long but packed full of thoughtful reflections. The structure is a series of letters, primarily from a pastor to his church. The way he was hired was a deviation from traditional practices, primarily because the search committee was getting disillusioned with the process. I found myself enjoying the structure. First, the letters aren't all that long, and while they do refer to earlier letters, they can be stand-alones, making it easy to read a letter or This is a newly released book, not all that long but packed full of thoughtful reflections. The structure is a series of letters, primarily from a pastor to his church. The way he was hired was a deviation from traditional practices, primarily because the search committee was getting disillusioned with the process. The art and skill of letter writing is a captivating way to tell a story. Particularly for Pastors, who rely on a New Testament largely composed of letters written to normal people like us. Winn Collier has imagined a world for us in which a Pastor (Jonas McAnn) administers pastoral care through writing letters to his congregation (Granby Presbyterian) over a long period of time. The gentle and piercing wisdom contained in these letters is timeless and serves today’s Christ-follower well in help The art and skill of letter writing is a captivating way to tell a story. Particularly for Pastors, who rely on a New Testament largely composed of letters written to normal people like us. Winn has written for periodicals such as Washington Post, Christian Century, Soul Journey, Christianity Today, In Touch, Campus Life, Leadership Journal, Radiant, Preaching Today and Clear & Seven. For six years, Winn was the Deeper Walk editor for Relevant Magazine. His first solo book, Restless Faith: Hanging on to a God Just out of Reach is a candid exploration into the perplexing, riveting Winn has written for periodicals such as Washington Post, Christian Century, Soul Journey, Christianity Today, In Touch, Campus Life, Leadership Journal, Radiant, Preaching Today and Clear & Seven. For six years, Winn was the Deeper Walk editor for Relevant Magazine. His first solo book, Restless Faith: Hanging on to a God Just out of Reach is a candid exploration into the perplexing, riveting and mysterious nature of God - and the humility we discover in the encounter. His second book Let God: The Transforming Wisdom of Francois Fenelon enters conversation with a 17th century French spiritual guide. Winn's most recent book, Holy Curiosity: Encountering Jesus' Provocative Questions, explores the strange reality that Jesus often held out a question rather than an answer. Winn's latest book is an epistolary novel, Love Big, Be Well: Letters to a Small-Town Church, narrates the story of Jonas McAnn and the community of Granby Presbyterian via letters Jonas writes to his friends (i.e. "congregation).